Ew. It's never a good sign when your chocolate faves sorta come to life. Reese's Peanut Butter Cups ~ truly one of the BEST chocolate inventions *ever* concocted. 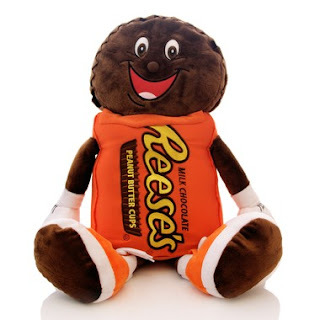 This stuffed version of said treat ~ truly EVIL. I'll never look at a Peanut Butter Cup the same. Shame. I *love* peanut butter cups -- my guilty pleasure. They may not have been if I had seen this stuffed toy first! It's quite troubling.... the face is what nightmares are made of!